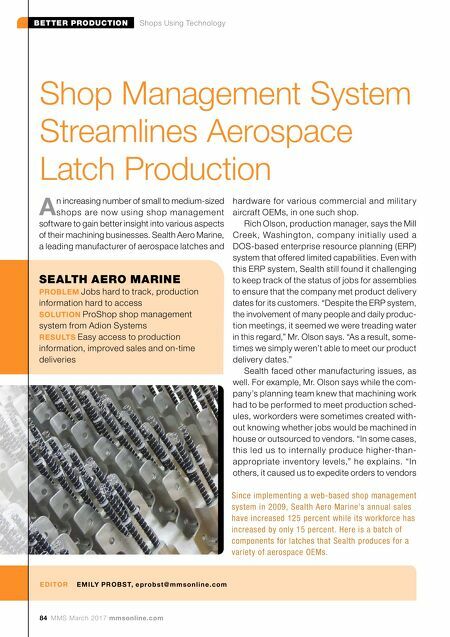 84 MMS March 2017 mmsonline.com BETTER PRODUCTION Shops Using Technology SEALTH AERO MARINE PROBLEM Jobs hard to track, production information hard to access SOLUTION ProShop shop management system from Adion Systems RESULTS Easy access to production information, improved sales and on-time deliveries E D ITO R E M I LY PRO B S T, e p r o b s t @ m m s o n l i n e.c o m Shop Management System Streamlines Aerospace Latch Production A n increasing number of small to medium-sized shops are now using shop management software to gain better insight into various aspects of their machining businesses. Sealth Aero Marine, a leading manufacturer of aerospace latches and hardware for various commercial and militar y aircraft OEMs, in one such shop. Rich Olson, production manager, says the Mill Creek, Washington, company initially used a DOS-based enterprise resource planning (ERP) system that offered limited capabilities. Even with this ERP system, Sealth still found it challenging to keep track of the status of jobs for assemblies to ensure that the company met product delivery dates for its customers. "Despite the ERP system, the involvement of many people and daily produc- tion meetings, it seemed we were treading water in this regard," Mr. Olson says. "As a result, some- times we simply weren't able to meet our product delivery dates." Sealth faced other manufacturing issues, as well. 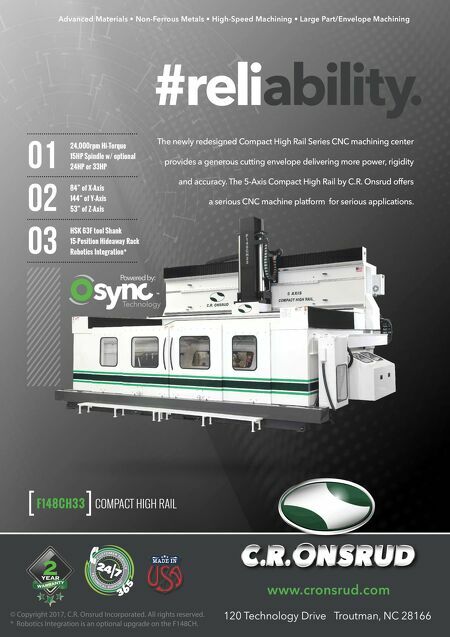 For example, Mr. Olson says while the com- pany's planning team knew that machining work had to be performed to meet production sched- ules, workorders were sometimes created with- out knowing whether jobs would be machined in house or outsourced to vendors. "In some cases, this led us to internally produce higher-than- appropriate inventor y levels," he explains. "In others, it caused us to expedite orders to vendors Since implementing a web-based shop management system in 2009, Sealth Aero Marine's annual sales have increased 125 percent while its workforce has increased by only 15 percent. Here is a batch of components for latches that Sealth produces for a variety of aerospace OEMs.